The first (non-binding) market test for Gastrade’s proposed floating LNG terminal in Northern Greece drew capacity bids of 12.2 bcm per year, more than twice its planned technical capacity. The project aims to promote diversified supplies, and increase energy security and competition in the Greek and regional SE European market. Can the project live up to expectations? The terminal consists of an offshore Floating Storage Regasification Unit (FSRU) in Alexandroupolis, which will be connected to the Greek national gas transmission system. The FSRU will have LNG storage capacity of up to 170,000 cm and regasification capacity of 5.5 bcm/year. The promoter is Greek company Gastrade; the Bulgarian transmission system owner and Greek shipowner Peter Livanos each have a 20% stake, while DEPA (the Greek gas supply company) wishes to obtain an equity stake too. Can the terminal promote diversification of supplies? 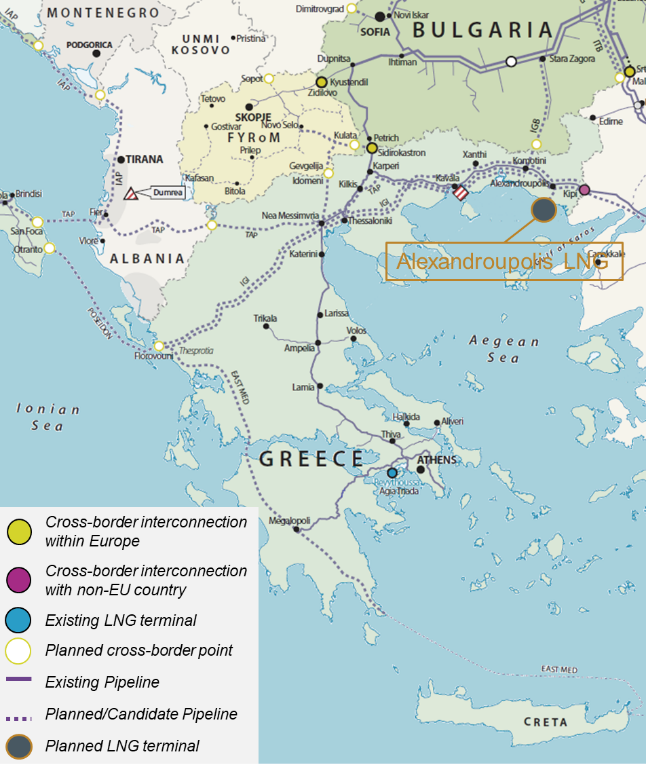 Greece already has three supply sources – Russian gas via Bulgaria (Romania and Ukraine), LNG via the Revithoussa terminal, and Azerbaijani gas via Turkey. The Alexandroupolis LNG terminal would be a fourth source and the second LNG terminal at a time when Revithoussa has had both its capacity and send-out rate expanded, despite being consistently underutilised (~30% in 2017). Bulgaria is vulnerable to supply disruptions from Ukraine (being solely dependent on Russian pipeline gas) and is actively seeking to diversify its supply options. But how much additional gas could Bulgaria absorb? Bulgaria is already committed to taking 1 bcm of Azerbaijani gas once IGB (Interconnector Greece-Bulgaria) is built, while it is also committed until end-2022 to buying 2.9 bcm/year from Russia (which is sufficient to satisfy its entire demand). The additional volumes could be used to supply other neighbouring countries, but planned interconnections (eg with Serbia and Romania) are still long delayed proposals. The other possibility is to supply the Trans-Adriatic Pipeline (TAP), which is currently being constructed. However, just 15% of its capacity remains unbooked, although TAP is soon planning further auctions. What about security of supply? Given Greece’s existing alternative supply sources and routes, long term security of supply seems to be secured. However, Greece has had shorter-term security scares eg most recently when gas-fuelled electricity and heating demand peaked in the 2016-17 winter (~50% higher than the corresponding period the year before). The current absence of storage in Greece suggests the Alexandroupolis LNG terminal could alleviate the risk of short-term disruptions. The ability of FSRUs to deliver gas speedily could help to provide peak delivery capacity. Security of supply benefits for the broader SE Europe region would require greater interconnectivity between markets. The lack of interconnectivity between TAP and the Western Balkan landlocked countries (North Macedonia, Kosovo, Serbia) also suggests the FSRU could not provide added security to these countries, while Italy would likely have sufficient alternative supply options. Can it facilitate competition and trading? Increased competition and trading potentially holds the greatest prospect for this project for the SE European region. It would, for example, provide a competing source at a time when (a) the Greek gas market is being opened to competition (removal of distribution monopolies and current plans for unbundling and privatising DEPA), and (b) gas-fired electricity generation is being expanded. Much, of course, will depend on the competitiveness of the supplied gas – while FSRU costs are competitive (compared to onshore terminals), the Revithoussa terminal does have significant excess capacity. If this were priced at short-run marginal cost, it could undercut the new terminal (both for supply to Greece and beyond). So, can the proposed FSRU deliver on its stated benefits? The answer is, it depends – and most notably on there being greater interconnection in the SE European region. The market test and the equity interest in the project suggest that the sector is betting on this happening.